PLEASE READ FULL PRODUCT DESCRIPTION BEFORE PURCHASE- Requires iOS 7.1 and above or Android 4.4 and above. 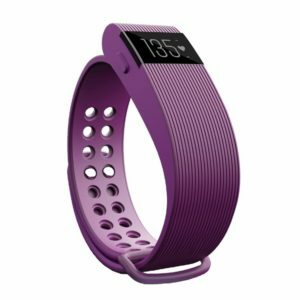 Use this device to track not only your heart rate, but steps taken, distance travelled, calories burned and active minutes. You get instant reminders when calls or texts are coming in, plus you can activate the Anti Lost feature to get alerted when your Phone becomes too far from the Smart Band. Never risk losing your phone again. IMPROVE SLEEP PATTERNS AND HABITS - Monitor how long and well you sleep, and wake only you (NOT ANYONE ELSE) with a silent alarm. How to pair with phone: 1. download app Verifit 2.0 from Apple Store or Google Play. 2. turn on phone bluetooth, go to the App=>>Device=>>Bind Device, search and pair the id with your phone. 3. once connected, the bracelet vibrates, time/date will be auto Synchronized with phone. ADVANCED BLUETOOTH TECHNOLOGY TIME AND DATE DISPLAY - You get to take advantage of Bluetooth 4.0 making connecting and transferring data to your Phone or mobile device a breeze every time. Bright OLED display. You get notifications when you receive CALLS and SMS messages. Can't pair the device? A: 1. check phone bluetooth list, forget all other bluetooth id ever connected. 2. go to app=>>device=>>unbind device. 3. then pair it again. TAKE ADVANTAGE OF HELPFUL REMINDERS!! - Set reminders to alert you when you have been sitting or motionless for too long. Take charge of your body today with our industry leading Smart Wristband. You will get Serious versatility that can even transform your phone into a Remote Shooting Camera using the Smart Band to control the shots. Requires iOS 7.1 and above or Android 4.4 and above. This Smart Band Does NOT Work With WINDOWS PHONES. ZERO EXTRA BULK TO YOUR DAILY ROUTINE! - Slim, comfortable and easy to wear. You will barely feel like you have anything on your wrist at all.Compatibility: APP for Andriod(4.4 or above os): Verifit 2.0, available from Google Play. APP for IOS(ios 7.1 or above os): Verifit 2.0, available from Apple Store.